Consulting Radiologists LTD (CRL) is a radiology outsourcing company that provides remote radiology reading services and interpretation services via teleradiology. With teleradiology, our group provides expert consultation and image interpretation to a large network of healthcare facilities via our sophisticated teleradiology network. Currently, CRL provides timely and accurate teleradiology interpretation services for over 50 facilities in the Upper Midwest. High-quality service and commitment to reliable patient care are at the core of what we do as teleradiologists. It’s our goal to make process and workflows as seamless as possible so physicians can provide patients with the best care possible. 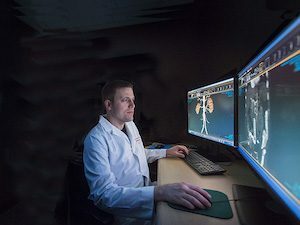 Our subspecialty radiologists practice primarily at Abbott Northwestern Hospital, a large quaternary care facility in Minneapolis, ranked among the top 50 in the country, and at CRL’s outpatient imaging centers, as well as remotely in various medical centers throughout the Midwest region. Providing teleradiology-based interpretation services for over 60 healthcare organizations, as well as on-site radiology services for 27 partner hospitals and clinics throughout the upper Midwest, we have become one of the most trusted physician-owned practices in the region. CRL is run by radiologists, meaning we have a strong foothold at every level of our teleradiology services. This ensures that concerns are addressed by putting patient care first. Because our leadership team is made up of industry veterans, we’re able to provide better services to hospitals, clinics, imaging centers and more. It’s our mission to provide our partners with comprehensive, streamlined and groundbreaking services that they need to provide the best care. CRL is an independent radiology group based out of the Twin Cities, providing a complete range of teleradiology services to the healthcare community. After 89 years of existence, CRL continues to remain a vibrant and independent practice, providing best-in-class teleradiology services with more than 65 physicians working throughout more than 100 facilities in the upper Midwest. Get in Touch with Our Team of Teleradiologists Today! If you are interested in working with CRL for teleradiology services, or are looking for additional information regarding our outsourced teleradiology imaging services, please use the links below or contact us, please contact our business development team using the contact us form.